An Austrian composer born August 16, 1953 in Graz (Austria). 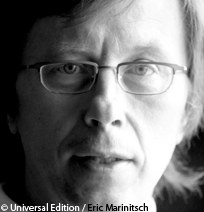 A pianist by training, Georg Friedrich Haas studied composition at the Musikhochschule in Graz then at that in Vienna, with respectively Gösta Neuwirth and Friedrich Cerha. He completed his training with a summer course at Darmstadt as well as a composition and computer music course at Ircam. Haas composes for all groupings: solo instruments (Solo für viola d’amore, 2000, premiered by Garth Knox); instrumental ensemble (Anachronism, 2013, commissioned by the Carnegie Hall); orchestra (Dark dreams, premiere conducted by Simon Rattle with the Berlin Philharmonic in 2014); operas often dealing with existential questions and themes such as suffering, illness and death (Nacht, 1998, chamber opera based on texts by Hölderlin; Morgen und Abend, 2015, with a libretto by Jon Fosse). Playing on the opposition between light and dark (In Vain, 2000, premiered by Klangforum Wien), between consonance and dissonance, between individual instrumental parts and the resulting overall sound, his music has become a vector for emotions and moods. Pushing back the acoustic and harmonic possibilities of the tempered scale,​ Haas is interested in microtonality, writes exploratory music and shows a certain attachment to the indistinct, the indeterminate and the aleatory (Hyperion, concerto for lights and orchestra, 2006). Although rooted in tradition, he does not hesitate to quote and recompose works of the past: Torso (2001, based on Schubert’s Unfinished Piano Sonata); Traum in des Sommers Nacht (2009, on figures from Mendelssohn). Georg Friedrich Haas is also the author of several theoretical texts on microtonality, spectral music and the works of Luigi Nono, Ivan Wyschnegradsky, Pierre Boulez and Franz Schubert.